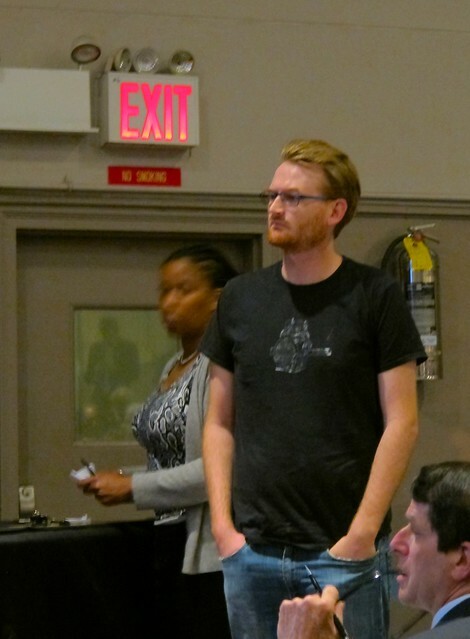 Philip Warren, Studio General Manager of Eastern Effects at 270 Nevins Street, one of the sites that may be taken by eminent domain, despite the fact that it contributes millions to the local economy. 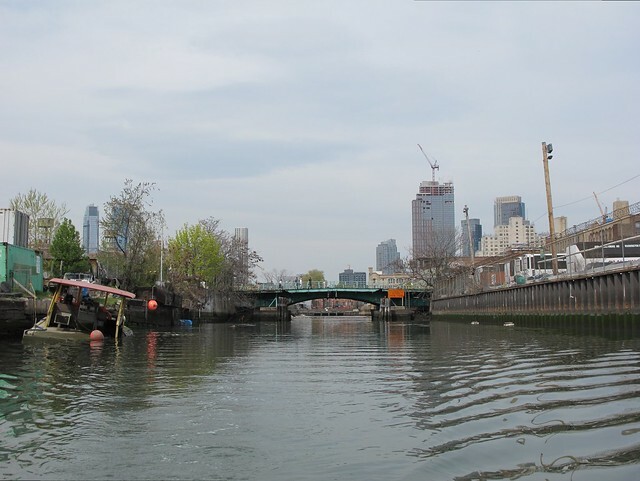 When the Environmental Protection Agency placed the Gowanus Canal on its National Priorities list, the Agency estimated that the environmental clean-up of our toxic waterway would cost $500 million and last 10 to 12 years. Why then, is EPA now willing to sign a Settlement Agreement with New York City, one of the responsible polluters, that will allow the City to delay the entire Superfund clean-up by four years, and will cost $510 million for just one of two overflow retention tanks that the City needs to build in order to keep raw sewage out of the canal. How did we get to the point where EPA seems to be bending backwards to accommodate New York City, which has used the Gowanus Canal as an open sewer for the past 150 years? This is what local residents came to find out last night at a community meeting held by the EPA to explain the settlement agreement which it is about to sign with the City. 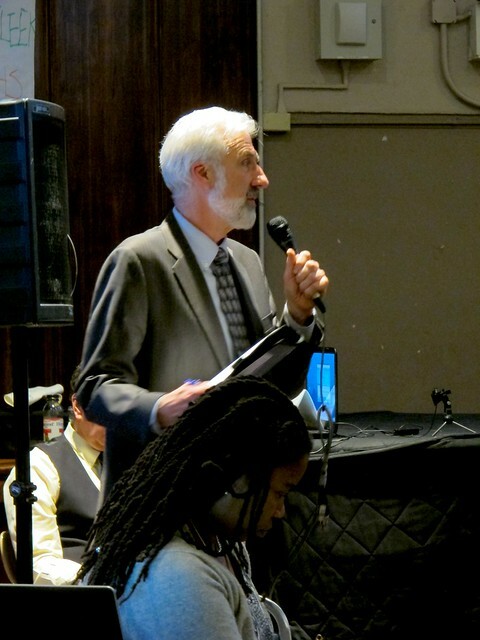 After giving a brief timeline of the Gowanus Canal Superfund clean-up, Walter Mugdan gave a detailed presentation that focused mainly on the agreement that was released to the public on April 14. "This is as complicated an administrative order under the Superfund program that we have ever been involved with," Mugdan told the audience. The focus of the agreement is on one of two mandated in-line retention tanks near outflow RH-034 at the head of the canal. The tank is a vital component of the clean-up and will capture Combined Sewage Overflow that, up to now, has just been dumped into the Gowanus during periods of heavy rain. Since this overflow is laced with Polycyclic Aromatic Hydrocarbons, these tanks are an important source control measure to make sure that the canal does not get re-polluted after it is dredged and capped. 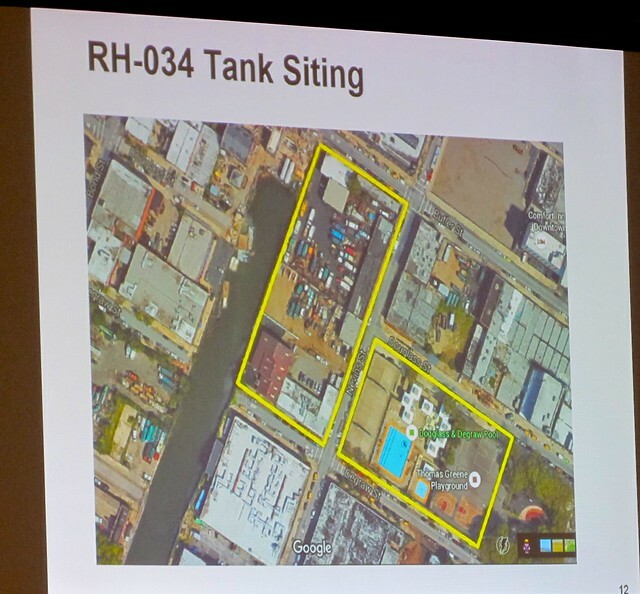 The EPA had suggested that New York City place the RH-034 tank under the Double D Pool at Thomas Greene Park, because it presented "potential synergies associated with anticipated removal of coal tar from beneath the Park site". These synergies, according to EPA, could "save time in Site acquisition and save significant construction costs" since National Grid will have to excavate the site anyhow. The City, on the other hand, wants to site the tank on two privately owned lots adjacent to the canal, directly across from Thomas Greene Park. To do so, New York City intends to seize by eminent domain 334 Butler Street and 242 Nevins Street. It also expects to either lease or purchase the building at 270 Nevins Street currently occupied by Eastern Effects. The cost of these three parcels would exceed $100 million dollars. The main argument given by the City for siting on the privately owned land at the head of the canal is that it wants to avoid longer disruption or permanent loss (alienation) of parkland at Thomas Green Park. To justify this claim, the NYC Department of Environmental Protection has, according to EPA, "excessively designed" the tank, but has also invented the need for a large 3-story head house. Obviously, the City's park alienation argument has swayed the EPA administration enough to allow the City to move forward with the plan, though Walter Mugdan reiterated that his agency" strongly prefers the park location over the two privately held parcels" and that "EPA believes construction of the RH034 tank at the Park location could be done more quickly, more easily, and at less expense than the head-of-the-Canal location." However, Mugdan explained that the Federal Agency still believes that the proposed agreement and order is "a favorable outcome for EPA". The Agreement gives the City four years to acquire the land, design the tank, remediate the contaminated soil, and prepare the site. 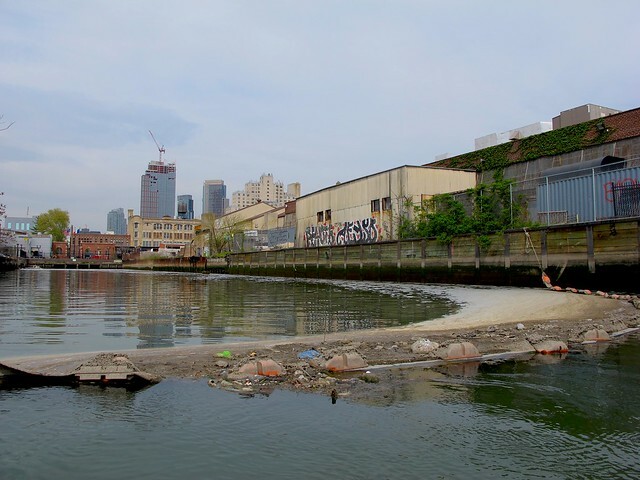 It stipulates monetary penalties if New York City fails to comply and commits DEP to dredge the CSO-related sediment that may accumulate after the Canal is cleaned but before the CSO tank is completed. Most importantly, the City waives the right to take legal action "related to the selection of the CSO controls contained in the 2013 Record of Decision." In addition, New York City is required to simultaneously design a tank for the Park location as a contingency should it become necessary to change from the head-of-the canal location in the event that City falls behind schedule. It is especially surprising that the Agreement does not mention the generous offer by the owners of both 334 Butler Street and 242 Nevins Street, who, in order to avoid losing their properties through eminent domain, were willing to donate parts of their parcels to the City to offset the potential loss of parkland if the City were to site the OH-034 tank in Thomas Greene Park. That would, to many local residents be a win for the landowners, a win for the City and, most of all, a win for the community. The EPA will wait to sign the agreement until the end of the (newly extended) public comment period on May 31. 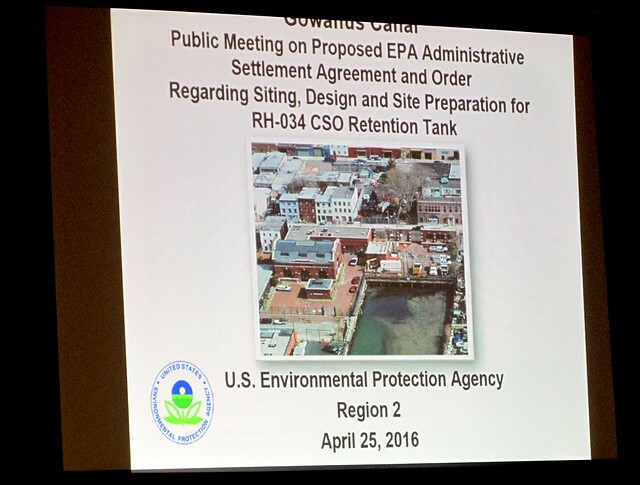 According to Mugdan, EPA is moving forward with it, "unless you [the public] think you have a better mousetrap." As someone who actively supported the listing of the Gowanus Canal as a Superfund site, as a member of the EPA Community Advisory Group from its inception five years ago, and as someone who has raised two children just two blocks away from the polluted waterway, I am truly amazed that the EPA would allow the City to callously prolong the clean-up, which means that local residents are unnecessarily exposed to toxins longer than they have to be. 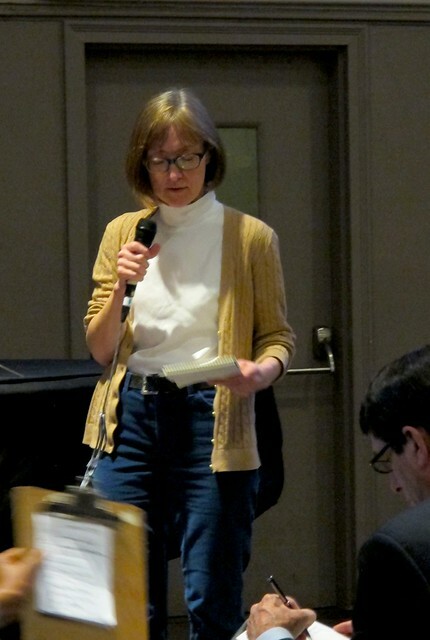 Back in February 2011, EPA Adminsitrator Judith Enck appeared in front of the Gowanus community surrounded by the Region 2 team she put in charge of designing the remedy for the Superfund clean-up. In front of the same audience in the same auditorium at PS 32, she declared: "Your canal is in good hands. You have the best and brightest EPA talent working on this." Five years later, we still have the brightest EPA talent trying to get the canal cleaned up, but they seem to be hindered by their boss, Ms. Enck, who has allowed politics, and not engineering to prevail. She has undermined her own team by caving in to the City's questionable arguments and agreeing to their over-designed, needlessly expensive plans. I felt sorry for Walter Mugdan last night. 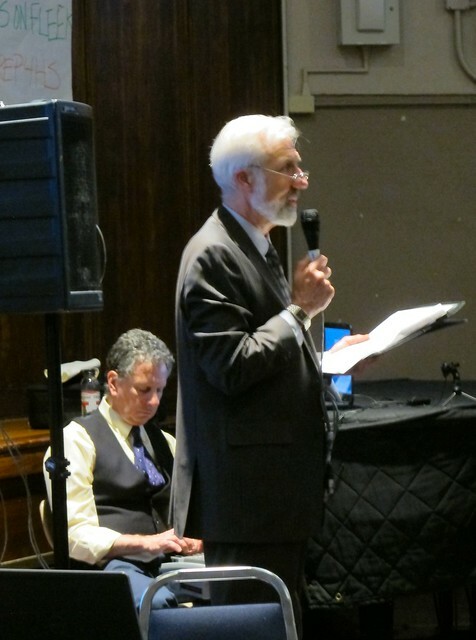 He did a reasonably good job trying to convince the community that this agreement between EPA and DEP is a good deal for Gowanus, but it was clear from questions and comments made last night that most residents were confused and disappointed by EPA's sudden meekness towards the City, one of the largest canal polluters. At the end, once again, the community is asked to be patient while politicians and lawyers take over the conversation and drive the agenda. How very foolish and sad this all is. I hope you will join me in submitting comments to EPA demanding that science, engineering and common sense be allowed to rule. Yes, there is a better mousetrap. We just need to demand it. or visit EPA’s document repository located at the Carroll Gardens Library at 396 Clinton St. in Brooklyn, New York. So, to be clear, the EPA, staffed with professionals and accomplished individuals in their field, whose only job it is to ensure the public safety, has reviewed a plan and deemed it in the public interest. And a few community members, of qualifications varying from none to minimal, have "concerns". I know which side smells like the canal. The map in your 5th image above marks the best solution with the red line rectangles. -----and the staging site just to the south on the block that is currently for sale. This would meet the ROD requirements, clean out the toxic parkland, and allow the thriving businesses to flourish along side the new business development that the Alloy folks want to pursue to bring 2000 jobs into an area. And best of all the city's objectives to expand public open space for local residents would happen without any exorbitant cost or time delays because of the piece of property they offered to donate on their site. Why is there any debate on this? Where is the environmental justice issue behind a cleanup plan that removes toxic land and leaves the community with an expanded park and an new swimming pool? Would the EPA please explain their reason for accepting such claim? Just build the tanks. Sooner than later. It is clear the EPA was forced to cave in to the city. Perhaps lawsuits were threatened. Whatever. has quickly spun out of control as land-use issues (the Double D pool, the parkland, etc) have clouded the stage and a wide array of people with vested interests have dominated the discussions. Now eminent domain with the idea of possible seizing MORE THAN A COUPLE of properties is on the table for no good reason except that the City "thinks" it is a sensible solution. Face it, The City of New York has never had the public health of the Gowanus community as a top priority and never will. That job is for EPA to do. That is why the EPA is here after all. 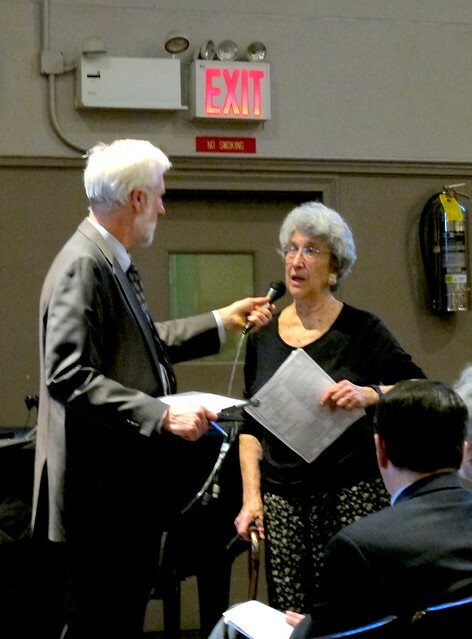 But, when the EPA is hampered and threatened as it has been by the usual NYC politics, the winners are the greediest among us, and the losers are the residents and the surrounding community, BOTH OLD and NEW of this dangerously contaminated waterway. Oh for a moment's clarity! Does it really make sense to let the public suffer longer with this chemical contamination? Of course not. Let us pray Walter comes to his senses STAT! KATIA HAVE YOU SEEN THIS TOO? 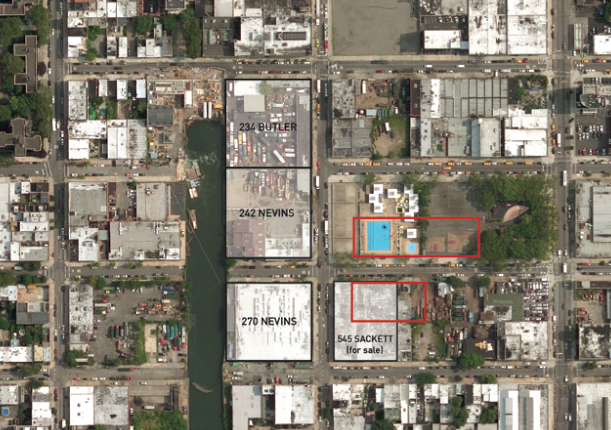 What are the chances the city is considering purchasing 233-239 Nevins, currently for sale for $24MM? 24,000 SF maybe not big enough?